In May of 1966 in Waterloo, NY, President Lyndon Johnson declared Decoration Day as a national holiday. It is the holiday that we now refer to as Memorial Day; a day during which our nation honors, thanks, remembers and celebrates those who have served the United States of America and the sacrifices they have made to protect us. We will never forget the men and women who have given their lives as they selflessly served this country and defended its people and our freedom; and we celebrate those who we are so blessed to have with us still. 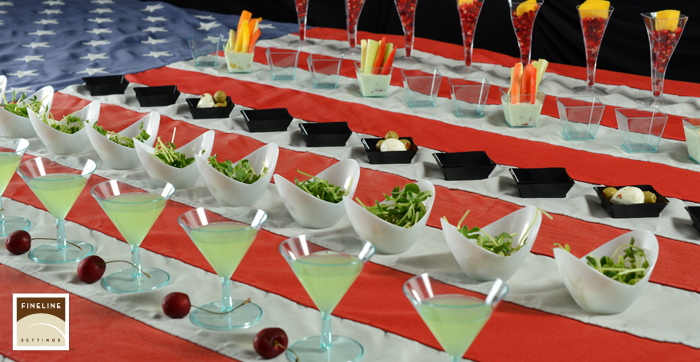 We know how important this holiday is for our customers, so we’re here to help you celebrate and honor the veterans in your life with one of our collections of Premium Disposable Dishware. We promise that as you serve your special guest, they will be happily surprised at the lengths you are going to celebrate them in style; and you’ll be able to enjoy your celebration knowing that all of your dishware and flatware can be tossed in the recycle bin at the end of the day! It goes without saying that nothing is more America than firing up the grill and roasting hotdogs, hamburgers, steaks and whatever else you can think of for your veteran. We invite you to take your famous BBQ chicken to the next level as you serve your guests on dishware that looks spectacular enough to serve at a black-tie wedding, but is durable enough for an outdoor barbeque with the family and friends! Oh, but don't forget to hand your vet a tall one in one of our Savvi Serve Tumblers to go along with those burgers and snack you have laid out on one of our Platter Pleasers compartment trays! When it comes to celebrating your special soldier, there is no room for the aggravation of hauling out the dishes and spending hours afterward cleaning up. Fineline wants the focus to be on your guest of honor and our goal is to make your celebration worry-free and easy- and what is simpler and more hassle-free than disposable? 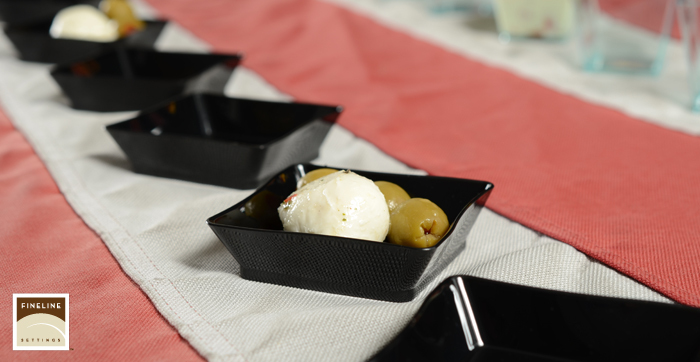 Not only can you serve your guests with the ease of recyclable plastic, but they’ll never be the wiser as they look upon the elegant and distinct style of one of our fabulous collections! Are you strapped for time and falling short on inspiration for your up-coming event? Don't you worry, we’ve always got your back! Take a look below at some of the recipe ideas and decoration ideas we’ve found to help make your Memorial Day… well, memorable! Chrissy over from the Taylor house has collected an array of recipe idea in her post 25 Memorial Day Recipes & Crafts! From Potato Salad to Shrimp Skewers, to Patriotic Mason Jar Luminaries, Chrissy has the answers to all of your Memorial Day needs! Be sure to check it out and let us know what a smashing success your event was! This week Fineline Settings wanted to do something special; so, along with sharing recipe and table setting ideas as we usually do; we wanted to take this time to honor a few veterans by expressing our respects as we acknowledge the great sacrifices they have made for our nation and pay homage to the memory of those who are no longer with us. Served in WWI,WWII & Korea. He became a Prisoner of War by the Japanese in 1941. Was awarded a “Prisoner of War” Medal. Honored as a hero, he defended and received beatings in place of his men until they were returned to the U.S Military at the end of the war in 1945. As an Engineer, Staff Sergeant Nahs served 6 months in Afghanistan in 2013 & received multiple Medals for his service. Senior Airman Nahs received an achievement Medal in 2012. Both SSgt Nahs & SrA Nahs served their country during the recovery after the devastation of Hurricane Sandy in NYC. If you have a story about a veteran close to your heart, we would love to hear about it. Please feel free to share it with us in the comments below!